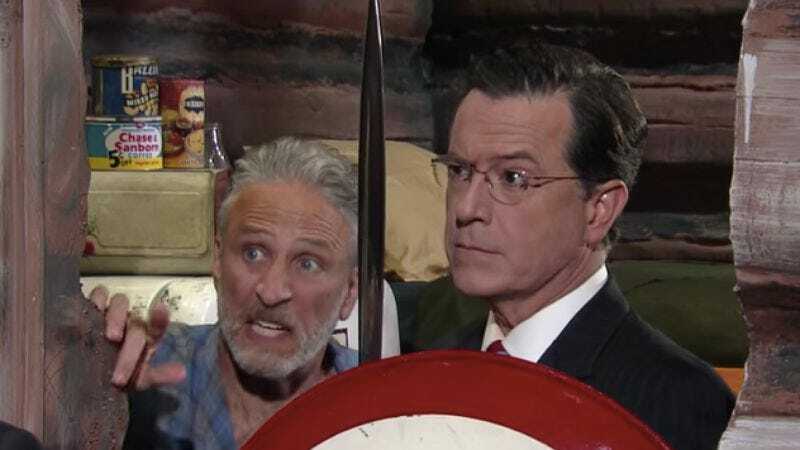 Here’s a silver lining to this year’s election fracas: It’s insane enough to bring both Jon Stewart and “Stephen Colbert” out of retirement. Stewart made his anticipated appearance on The Late Show last night, where he was lured out of his remote cabin by host Stephen Colbert’s terrifying tales of the whole Donald Trump nomination situation. Stewart has been too busy making kale-jerky and rocking that post-Daily Show beard to pay attention to anything, necessitating a spit take when he learns just who Republicans have nominated. But Stewart has had some company out in the backwoods of wherever. He’s been prepping for the end of days with one “Stephen Colbert,” who also needed to expel some liquid from his mouth upon hearing about the Trump of it all. Another difference between Trumpiness and Truthiness? “Truthiness was from the gut, but Trumpiness clearly comes from much further down the gastrointestinal track,” he said. Aw, we’ve missed you, “Stephen.” You, Jon, as well. We’re only a little mad that you abandoned us in our time of need.